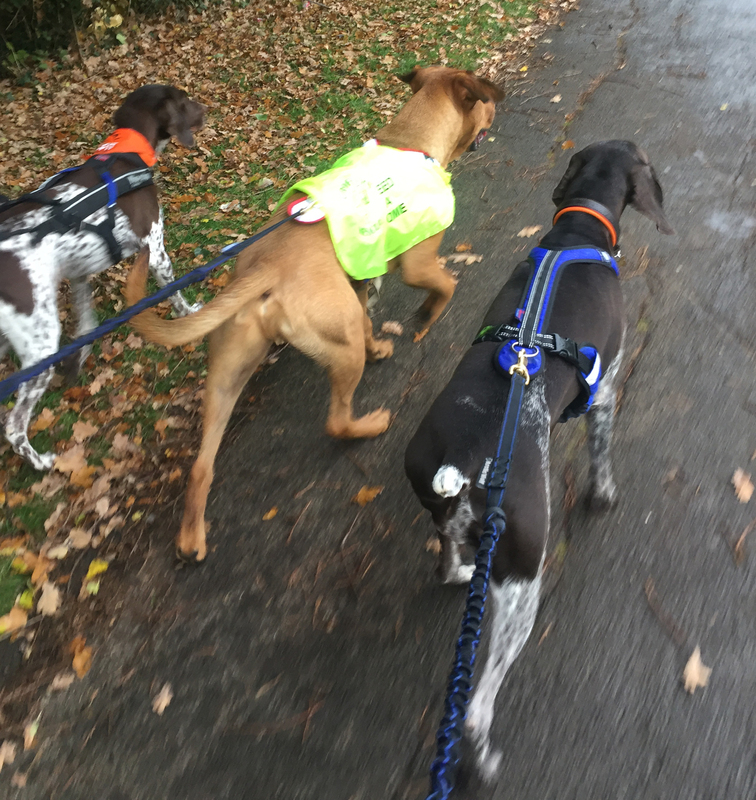 Recently we drove over to the Basildon parkrun to join RSPCA Inspector Marie Hammerton, and rescue dog Diesel, to introduce them to the benefits of running handsfree using canicross kit. Marie has been doing an amazing job taking rescue dogs along to the local parkrun. By running with them there, she has helped rehome over 20 dogs and we found out about her good work after seeing some information online. Running with just a lead and collar is not the most comfortable thing for either the runner or the dog, so we took along our canicross equipment to show how much easier it is giving you better balance, control and hands-free running. Marie arrived with Diesel, a lovely dog who had literally just arrived at the kennels the night before. He was full of energy and raring to go, despite the heavy rain! We ran through the kit with Marie and fitted Diesel with the correct size harness and started slowly at the back of the group. After the initial excitement at the start, Diesel settled into his stride and was a natural. We ran either side with our dogs and they all ran along happily together. As part of our help with rescue dogs, we left Marie, with a canicross kit and a selection of different harnesses, so that she can continue her amazing work. We’ve also written our own guidelines on running with your dog at a parkrun with helpful tips so you know what to expect. You can read it here. Hi Ali, Running (or walking) with rescue dogs is the most rewarding thing we have done. If you still want to get involved then I would suggest you contact one of your local centres. They tend to run their charities on volunteers and donations alone so really need the help. Start by contacting them & explaining how you could help the younger, more active dogs by taking them out for a run. If they need any convincing feel free to direct them to me at hell@dogfit.co.uk & I will happily share all the work we’ve been doing & the amazing, positive feedback from the rescue centre we’ve been supporting. Best of luck, it really is a wonderful thing to do as most of these dogs don’t get out every day.